Superstition Fire and Medical District began a historic new service to the area Monday, Jan. 4. With the addition of five new ambulances into its fleet of state-of-the-art emergency rescue equipment, SFMD paramedics and EMTs will be responding to calls where the transport of critical patients is needed. Less critical, or low-acuity medical transports, will continue to be provided by Southwest Ambulance. Southwest Ambulance has provided all ambulance service to the citizens of the fire district for the past two decades. But as Fire Chief Paul Bourgeois explains, the environment has changed and it’s opened the door for a new partnership and new service delivery model for the SFMD. SFMD successfully worked with Rural-Metro Corp., Southwest Ambulance’s parent company, to develop a ground-breaking Memorandum of Understanding to capture the spirit and intent of this arrangement. “The MOU helps to stabilize and strengthen our relationship with Rural-Metro,” said Chief Bourgeois. SFMD staff was able to present a cost model showing conservatively that the new ambulance service will be fully self-sustaining in three to four years, with total investment recovery and positive revenue within four to five years. “Our finance division worked very hard to show the Department of Health Services that this will be a benefit to our community,” said Chief Bourgeois. The new ambulances are 2015 Horton models and will match looks and colors with the rest of the SFMD fleet of emergency vehicles. Each ambulance costs approximately $208,000. We received a $200,000 grant from the Gila River Indian Community for one of them. The new units are equipped with many new features for both patient comfort and care, and items that will assist the paramedics while treating a patient while in route to the hospital. Loading and unloading patients will be made much easier based on the latest technology and equipment available. Each new ambulance is equipped with a Stryker Power Pro Cot – Power-PRO XT. This innovative battery-powered hydraulic system that raises and lowers the patient with the touch of a button is coupled with the Stryker Power-Load cot fastener system, which lifts and lowers the gurney into and out of the ambulance, reducing the risk of injuries. Helping to allow the paramedic to do the work needed in the safest manner possible, the new ambulances are also equipped with liquid-filled suspension springs, providing significant ride and handling performance improvements over conventional steel and air spring suspension systems. It is also a much more comfortable experience for the patient. With the high temperatures of our summer months to contend with, each unit’s newer air-conditioning technology allows average cool down times of about nine minutes compared to the average 22 minute cool down time in older units. If you would like to know more about the SFMD, visit our website or call our offices at 480-982-4440. Editor’s note: Dave Montgomery is the assistant fire chief and public information officer for the Superstition Fire and Medical District. The SFMD encompasses 62 square miles and serves Apache Junction, the unincorporated areas of Gold Canyon, Superstition Foothills, Goldfield Foothills and Entrada Del Oro. Hightail it to Superstition Mountain Museum for Heritage Days, Jan. 16-17. 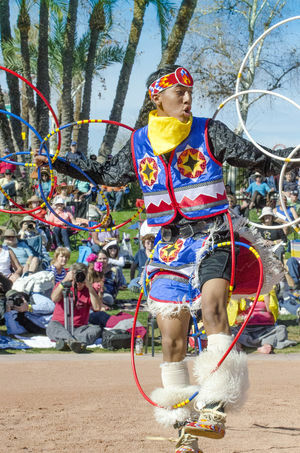 The weekend celebration will highlight the history and lore of the Superstition Mountains ranging from the earliest human history with indigenous Native American culture to recent events such as the Apacheland Movie Ranch. Performances by the Yellow Bird Indian Dancers will wow audiences with their award-winning dances. Performances will be on both days at 11 a.m. and 1 p.m. There will also be Native arts and crafts for sale by the craftsmen and women themselves. Learn how they make their distinctive wares and the meanings behind the patterns, materials and designs. Ermal Williamson, a bona fide John Wayne impersonator, will offer Western entertainment along with his wife Paola — a champion yodeler. They will be performing each day at 10 a.m. and 2 p.m. More Western fun will be had with Cowboy Steve Cassat and his rope tricks. Teton Ken will provide burro rides and lead gold panning expeditions. Film and TV actor Michael Dante will be present all weekend selling and signing his books and discussing the filming that took place at Apacheland Movie Ranch. Fellow Apacheland alumni, Ron Nix and Hank Scheffer will also be there. Food will be available on the museum grounds and everyone is invited to explore the various trails and walks. This is the perfect family event to explore the East Valley’s historical backyard. With so much fun to be had, you might want to come both days! DETAILS>> Jan. 16-17. Superstition Mountain Museum, 4087 N. Apache Trail, on Highway 88 (SR88). $5 per person. Children 10 and under free. 480-983-4888.superstitionmountainmuseum.org.